Calculate angular acceleration of an object. Observe the link between linear and angular acceleration. Figure 1. 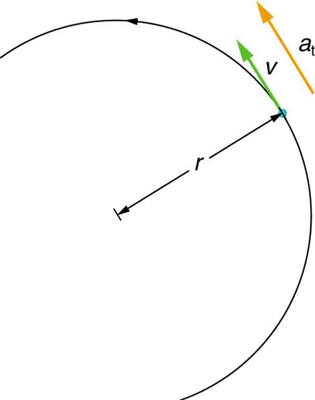 This figure shows uniform circular motion and some of its defined quantities. where is the change in angular velocity and is the change in time. The units of angular acceleration are or If increases, then is positive. If decreases, then is negative. Suppose a teenager puts her bicycle on its back and starts the rear wheel spinning from rest to a final angular velocity of 250 rpm in 5.00 s. (a) Calculate the angular acceleration in (b) If she now slams on the brakes, causing an angular acceleration of how long does it take the wheel to stop? The angular acceleration can be found directly from its definition in because the final angular velocity and time are given. We see that is 250 rpm and is 5.00 s.
Note that the angular acceleration as the girl spins the wheel is small and positive; it takes 5 s to produce an appreciable angular velocity. When she hits the brake, the angular acceleration is large and negative. The angular velocity quickly goes to zero. In both cases, the relationships are analogous to what happens with linear motion. For example, there is a large deceleration when you crash into a brick wall—the velocity change is large in a short time interval. Figure 2. In circular motion, linear acceleration a, occurs as the magnitude of the velocity changes: a is tangent to the motion. In the context of circular motion, linear acceleration is also called tangential acceleration at. Linear or tangential acceleration refers to changes in the magnitude of velocity but not its direction. We know from Chapter 6 Uniform Circular Motion and Gravitation that in circular motion centripetal acceleration, refers to changes in the direction of the velocity but not its magnitude. 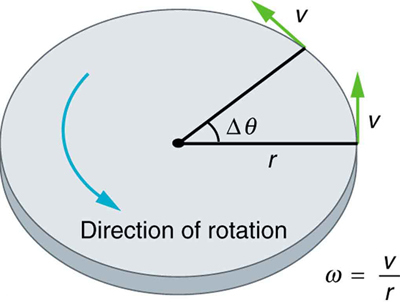 An object undergoing circular motion experiences centripetal acceleration, as seen in Figure 3. Thus, and are perpendicular and independent of one another. Tangential acceleration is directly related to the angular acceleration and is linked to an increase or decrease in the velocity, but not its direction. Figure 3. Centripetal acceleration ac occurs as the direction of velocity changes; it is perpendicular to the circular motion. Centripetal and tangential acceleration are thus perpendicular to each other. Figure 4. 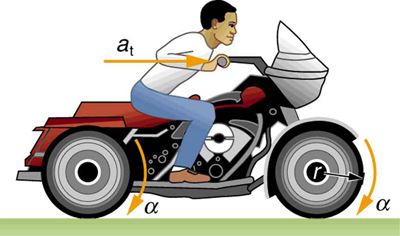 The linear acceleration of a motorcycle is accompanied by an angular acceleration of its wheels. We are given information about the linear velocities of the motorcycle. Thus, we can find its linear acceleration Then, the expression can be used to find the angular acceleration. Units of radians are dimensionless and appear in any relationship between angular and linear quantities. So far, we have defined three rotational quantities— and These quantities are analogous to the translational quantities and Table 1 displays rotational quantities, the analogous translational quantities, and the relationships between them. Table 1. Rotational and Translational Quantities. Sit down with your feet on the ground on a chair that rotates. Lift one of your legs such that it is unbent (straightened out). Using the other leg, begin to rotate yourself by pushing on the ground. Stop using your leg to push the ground but allow the chair to rotate. From the origin where you began, sketch the angle, angular velocity, and angular acceleration of your leg as a function of time in the form of three separate graphs. Estimate the magnitudes of these quantities. 1: Angular acceleration is a vector, having both magnitude and direction. How do we denote its magnitude and direction? Illustrate with an example. Join the ladybug in an exploration of rotational motion. Rotate the merry-go-round to change its angle, or choose a constant angular velocity or angular acceleration. Explore how circular motion relates to the bug’s x,y position, velocity, and acceleration using vectors or graphs. 1: Analogies exist between rotational and translational physical quantities. Identify the rotational term analogous to each of the following: acceleration, force, mass, work, translational kinetic energy, linear momentum, impulse. 2: Explain why centripetal acceleration changes the direction of velocity in circular motion but not its magnitude. 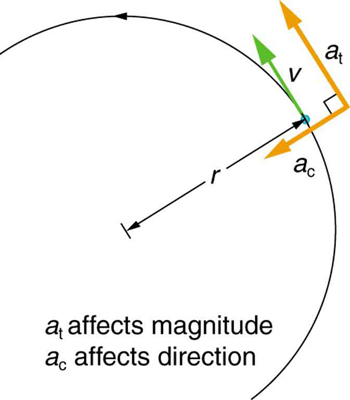 3: In circular motion, a tangential acceleration can change the magnitude of the velocity but not its direction. Explain your answer. 4: Suppose a piece of food is on the edge of a rotating microwave oven plate. Does it experience nonzero tangential acceleration, centripetal acceleration, or both when: (a) The plate starts to spin? (b) The plate rotates at constant angular velocity? (c) The plate slows to a halt? 1: At its peak, a tornado is 60.0 m in diameter and carries 500 km/h winds. What is its angular velocity in revolutions per second? An ultracentrifuge accelerates from rest to 100,000 rpm in 2.00 min. (a) What is its angular acceleration in (b) What is the tangential acceleration of a point 9.50 cm from the axis of rotation? (c) What is the radial acceleration in and multiples of of this point at full rpm? You have a grindstone (a disk) that is 90.0 kg, has a 0.340-m radius, and is turning at 90.0 rpm, and you press a steel axe against it with a radial force of 20.0 N. (a) Assuming the kinetic coefficient of friction between steel and stone is 0.20, calculate the angular acceleration of the grindstone. (b) How many turns will the stone make before coming to rest? You are told that a basketball player spins the ball with an angular acceleration of (a) What is the ball’s final angular velocity if the ball starts from rest and the acceleration lasts 2.00 s? (b) What is unreasonable about the result? (c) Which premises are unreasonable or inconsistent? 1: The magnitude of angular acceleration is and its most common units are The direction of angular acceleration along a fixed axis is denoted by a + or a – sign, just as the direction of linear acceleration in one dimension is denoted by a + or a – sign. For example, consider a gymnast doing a forward flip. Her angular momentum would be parallel to the mat and to her left. The magnitude of her angular acceleration would be proportional to her angular velocity (spin rate) and her moment of inertia about her spin axis. 10.1 Angular Acceleration by OpenStax is licensed under a Creative Commons Attribution 4.0 International License, except where otherwise noted.